Since the coup of July 3, 2013, Egypt's de facto ruler Field Marshal Abdel Fattah al-Sisi has pursued a clear and uncompromising policy toward the Muslim Brotherhood and Egypt's Islamists. Sisi has blocked any return to politics for the Brotherhood, instead seeking to maneuver them into open confrontation with the authorities. He has dismissed any genuine distinction between the Brotherhood and the more extreme and openly insurgent jihadist currents. In so doing, Sisi and his colleagues upturned what had slowly become conventional wisdom in the West and part of the region – namely, that the Muslim Brotherhood was a legitimate political organization, and that their rise was possibly benign, and probably inevitable. So far, Sisi's policy has been relatively successful. It has provoked a campaign of mass civil disobedience by the Brotherhood and its supporters, as its instigators probably knew it would. The authorities in Cairo are also dealing with an ongoing problem of terrorism in northern Sinai. The jihadist groups sometimes manage to strike west of the Suez Canal. But in terms of power, none of this poses any threat to the field marshal's continued rule. In recent days in Egypt, a series of developments have further reflected the stark and uncompromising nature of Egypt's counter-revolution. On Monday, a court in the town of Minya passed death sentences against 683 supporters of the Muslim Brotherhood and the government of ousted president Mohamed Morsi. Among the condemned were Muslim Brotherhood Supreme Guide Mohammed Badie. Badie, as the most senior official of the Brotherhood in Egypt, was arguably the most powerful man in the country during the rule of the Brotherhood. He and 682 others were convicted on Monday of attacking a police station in Adawa on August 14, 2013, and killing a police officer, Mamdouh Kotb Mohamed Kotb, following the breakup by the Egyptian authorities of the Brotherhood protest at the Rabaa Square in Cairo. The verdicts must be ratified by Egypt's grand mufti before they can be carried out. June 21 has been set as the deadline for ratification. It is likely that a large proportion of the death sentences will be commuted. Of 529 death sentences handed down in March against supporters of the Brotherhood, 37 were this week confirmed. In addition, Egyptian authorities this week ordered the banning of the April 6 youth movement. Established in 2008, the group played a prominent role in the toppling of former president Hosni Mubarak in January 2011. The Court for Urgent Matters confirmed the ban on the group's activities, charging it with engaging in "espionage and defamation of the state." The April 6 movement is set to appeal the ban. Presidential and parliamentary elections in Egypt are scheduled to take place in the coming months. 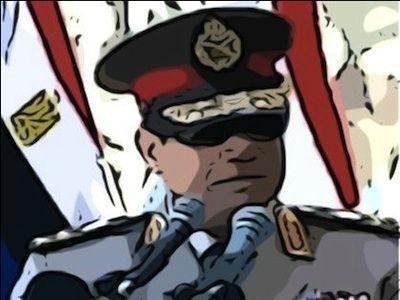 Sisi is likely to be elected president in polls set for May 26-27. Parliamentary elections will take place later in the year. The Tamarod movement, which supported the coup, has said that it will run as a party in the elections. Meanwhile, the Brotherhood's campaign of civil disobedience continues to fizzle on. One man was killed in clashes between supporters of the movement and police at a funeral in the Nile Delta. Brotherhood supporters also tried to block a main highway in the greater Cairo area, leading to 12 arrests. Western countries are expressing concern at the draconian measures adopted by Sisi. US Sen. Patrick Leahy, chairman of the Senate Appropriations Subcommittee, has refused to sign off on military aid to Egypt following the announcement of the 683 death sentences this week. Germany summoned the Egyptian ambassador to Berlin to protest the sentences. Certainly, Sisi's approach is paradigmatically different from the Western response to the "Arab Spring" unrest of 2011-12. Former US secretary of defense Robert Gates, in his recent book of memoirs Duty, describes how President Barack Obama overrode the advice of his most senior national security officials when the unrest against Mubarak began. Concerned, Gates contends, not to appear on the "wrong side of history," and influenced above all by security advisers Denis McDonough, John Brennan and Ben Rhodes, the president called Mubarak to demand his resignation. This act made Mubarak's fall inevitable. It also set the tone for what then became received wisdom on the inevitability and desirability of this fall, and set in motion the events that led to the Muslim Brotherhood's subsequent triumph. Sisi and his colleagues, by contrast, have taken the view that with regard to the Muslim Brotherhood and its allies, politics must mean the continuation of war by other means. This conclusion is shared by Sisi's key regional backers – Saudi Arabia and the United Arab Emirates – and by Israel. It derives from the understanding that the Brotherhood itself, like other totalitarian movements, regards politics as a method of waging war by other means, and therefore any effective response to the movement must involve a similar approach. The new political dispensation set to emerge this year will not represent a shining example of democracy for the Arab world. It is likely to combine authoritarian and representative elements, and to be accompanied by a smoldering Islamist attempt at insurgency. It will, however, conclusively draw a line under the possibility of the emergence of a Sunni Iran on the Nile. For this, Sisi will continue to enjoy the quiet gratitude of opponents of Iran in Jerusalem, Riyadh and elsewhere in the region.